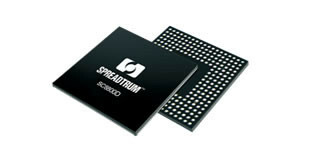 The Spreadtrum SC7731 is a cheap entry level ARM SoC (System on a Chip) that is used mostly for Android based smartphones. It is manufactured in 28nm and integrates a quad-core Cortex-A7 processor cluster, a ARM Mali-400 MP2, an LPDDR2/3 memory controller and radios for up to HSPA+. The CPU cores are clocked at up to 1.3 GHz and therefore the performance is only in the entry level for casual tasks. Thanks to the small Cortex A7 cores and the 28nm process, the Spreadtrum SC7731 can be used in small smartphones.